Juniata third baseman Kali Foltz, right, is unable to make a play on Greenwood runner Paige Trude. 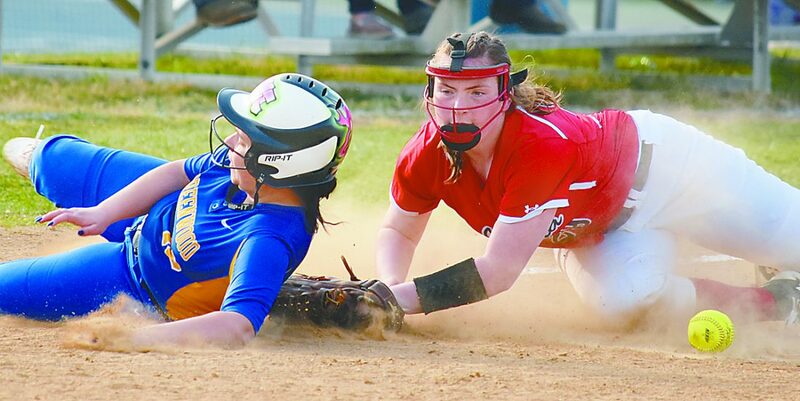 MIFFLINTOWN — In what started out as fast moving game, Juniata made the necessary changes at the plate to pull away with a 15-5 win over Greenwood in six innings in Tri-Valley League softball Thursday night. Hannah Gorman was making quick work of the Indians (2-4), sitting down the first four batters in order with the last three all ending in strikeouts. It looked like she was headed toward a fourth consecutive strikeout, but Laney Dowling had something else in mind. Dowling turned on a 2-2 pitch and ripped it to straightaway center field to score the game’s first run. And if one home run wasn’t enough for the Indians, Hunter Johns then launched a home run of her own to left field to give the Indians back-to-back home runs. That was the turning point for a team that was often told to move up in the box and get its timing down. The Indians put everything they had behind a six-run fourth inning. Olivia Laub kicked things off with an infield single, beating out the throw from shortstop. She didn’t stay on the bases long as Abby Adair helped her own cause, doubling to left to drive in Laub. The top of the lineup — Mya Rush, Lexie Berry and Maci Kreider — then loaded the bases via an RBI single to score Adair, a walk and another single. Kali Foltz then drove in Rush and Berry on a single to center. Both Foltz and Kreider then proceeded to score on a double off the bat of Johns. Foltz went 3-for-5 and drove in a game-high five runs while Johns was 3-for-3 with three RBIs. As for Greenwood (0-6), coach Bub Walton said after the team’s loss to East Juniata on Tuesday that he wants to see the team play better defense. The girls both listened and executed. The Wildcats did have two errors on the ledger, but they were playing a much better game with their gloves. The sure sign of such? The players were diving for the ball and turning the uniforms from blue and gold to brown and green. The Wildcat offense continued to swing the bats well, but this time it was the middle of the order doing most of the damage with No. 4 hitter Jenna Sherrick and No. 6 hitter Alli Walton each going 2-for-3. Sherrick’s line includes a double. Greenwood caught a break in the Indians’ fourth inning offensive performance as the umps called Johns out for getting off the base too early. That then led to the Wildcats avoiding the 10-run rule earlier and putting together its best offensive inning in the sixth, scoring three runs. Mary Gantt provided the biggest hit, a two-run, ground-rule double to left to score Trude and Sherrick, who worked a walk and a double beforehand. Gantt came around to score on Walton’s single to left-center field. Juniata hosts Upper Dauphin while Greenwood competes in the PeCo tournament, both today. WP: Abby Adair. LP: Hannah Gorman. SO: Gorman 5 (G); Adair 4 (J). BB: Gorman 5 (G); Adair 2 (J). HR: Laney Dowling, Hunter Johns (J). 2B: Jenna Sherrick, Mary Gantt (G); Johns (J). MH: Sherrick 2-3, Alli Walton 2-3 (G); Mya Rush 3-4, Kali Foltz 3-5, Johns 3-3, Olivia Laub 2-4, Abby Adair 2-3 (J). RBIs: Gorman, Sherrick, Gantt 2, Walton (G); Rush 2, Maci Kreider, Foltz 5, Dowling, Johns 3, Laub, Adair (J).